At this point, the sad-sack New York Jets aren't a circus, as the New York Post insinuated back in September. They're a bizarre performance art project that only a few people can tolerate watching. Their inept handling of seemingly every decision has become impressive. The team's technique of having no distinct quarterback depth chart is now crossing over to their handling of a new general manager. 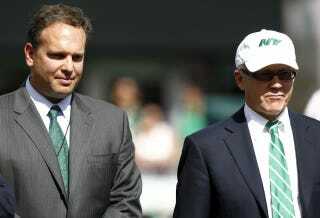 The Jets want to try and get another general manager to work side by side with current GM Mike Tannenbaum, even though that idea would essentially nullify the whole purpose of a general manager. The Jets are trying to beef up their front office, particularly in personnel, given their failing in the draft and free agency in recent years. But owner Woody Johnson is looking for a way to keep Tannenbaum in a different capacity, primarily as a negotiator/cap guy, sources said. The team has quietly reached out to potential candidates to gauge interest in the bizarre arrangement, including approaching Mike Maccagnan, Houston's director of college scouting. Several potential GM candidates — men expected to garner interviews for soon-to-be-open general manager jobs — said they would never consider taking the Jets job under these circumstances and doubted that any strong candidate would. "That's totally ridiculous," one exec said. "Only the Jets." Now I can't wait to see how they handle the task of keeping or firing Rex Ryan.